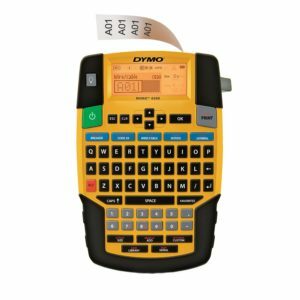 The DYMO Rhino 4200 has many built-in features, numerous tape material options, convenience of a QWERTY key pad, an easy to use interface, and great pricing compared to its competitors. When it comes to remembering, I don’t. So began my hunt for a trusty label maker that would cover all the bases and not cost me a fortune. Comfort would be nice, but I wouldn’t make it a requirement if I found something I liked. Primarily I needed something that was highly functional and effective when it came to labeling cables among other items. Fortunately I did not have to make that concession. The QWERTY key pad proved to a fairly unique and wonderful feature not found on many other label makers. When I originally came across the DYMO Rhino 4200 I thought to myself this looks a bit different than the typical label maker. As I investigated further I decided it was time to make the purchase since I desperately needed a label maker at the time of my purchase. I had a ton of network cable drops that needed a label, along with face plates, RG6 drops, patch panels, tool drawers, and a few containers. I notice this particular label maker accepted a fairly common tape cartridge with plenty of size, color, and material options. This proved really important in working with different surfaces like PVC cables, metal junction boxes, and rough plastic surfaces. 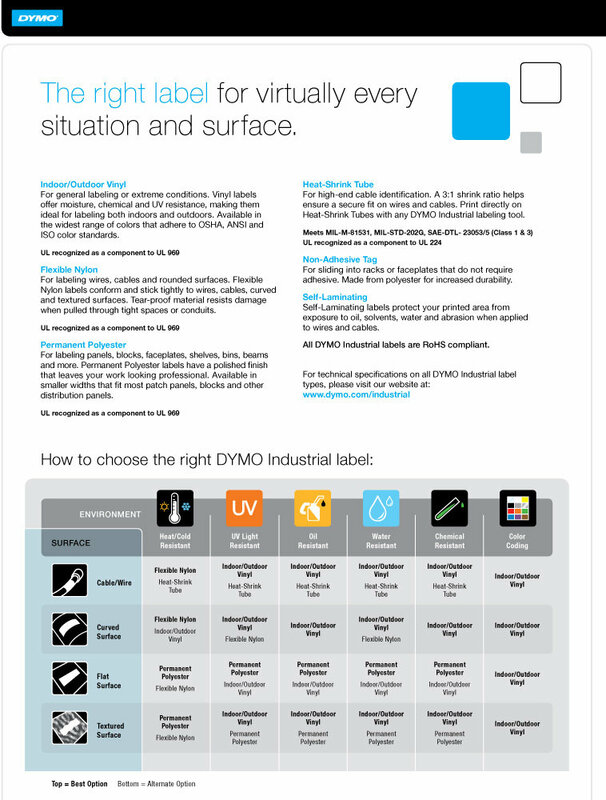 Through the various functions on the DYMO Rhino 4200 you can orient text in different ways and sizes to accommodate specific applications. The following functions are available using the blue mode buttons: Breaker/Module, Code 39/Code 128, Wire Cable/Flag, Rotate/Align, General/Fixed. I use the “General” mode quite a bit for generic applications like labeling a tool drawer or storage bin. While I use “Wire Cable” to identify Cat5e/6/6a cables. There is a Flag mode for cables like fiber optic that have a surface area too small for wrap-around labels. When it comes to applications like labeling patch panels the “Fixed” mode allows you to set a repeating distance. At that point you can add values or allow the DYMO Rhino 4200 to automatically sequence each position. For example you would type “Drop#” and it would append a sequenced digit following your label (Drop#1, Drop#2, Drop#3). An excellent feature if you find yourself doing this often. One technique I frequently use for labeling cables is to identify the source and destination at each end of the cable. This allows me to print the same label twice for efficiency and adds consistency to any implementation. For example where you have a cable going from a router to a switch, I would generate the label as “Router1-P2 Switch2-P11”. That way the source and destination would repeat as the label wrapped around the cable. That way no matter what end of the cable you are looking at you are aware of the starting point and ending location. When it comes to the different tape materials, sizes, and colors you have quite a few options. 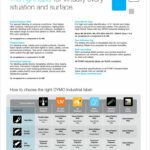 DYMO publishes some useful graphics and charts to aid you in finding the right tape for your specific job. 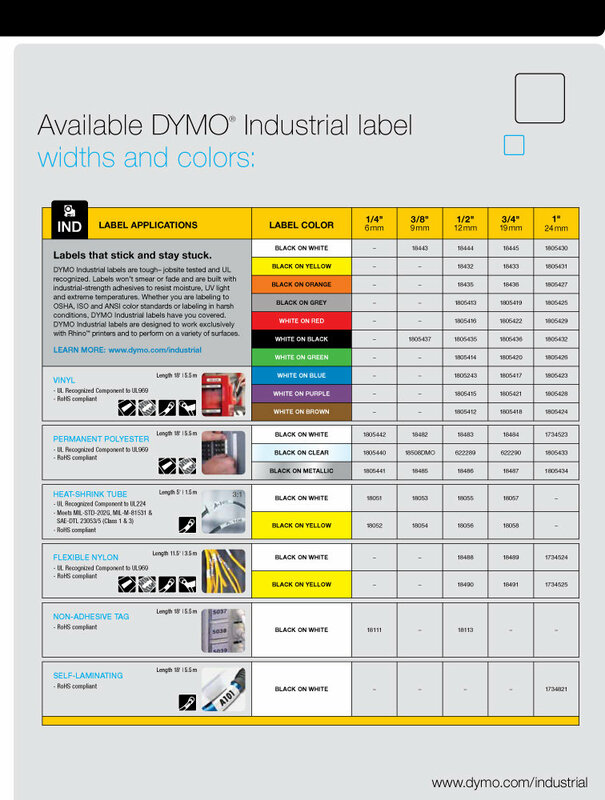 The DYMO Rhino 4200 uses the “IND” cartridge type. I’m going to go out on a limb and assume that is short for industrial. There are five different material applications you can select from when selecting your tape: Vinyl, Permanent Polyester, Heat-Shrink Tube, Flexible Nylon, and Non-Adhesive Tag. 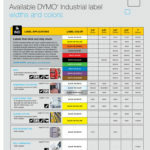 Vinyl has the largest color selection and is considered to be a general purpose label type, while Flexible Nylon is the correct choice when working with cable labels. The flexing nature of the tape allows the label to flex as the cable bends, preventing the label from detaching itself. See the following graphic for sizing and use. I have successfully used this label maker for years and I can say that it is the best all around tool for this task. I consider the QWERTY keyboard, Hot/Function Keys, material label options, label ease of application, low price, and battery life to collectively make the DYMO Rhino 4200 my go-to label maker for all my labeling needs. I’ve found it so useful that I have actually purchased three of them, so I can keep them at different sites so I always have something available. That would not be an option if it were an expensive label maker, so that is another bonus. Thanks for posting Greg. I took a closer look at it, and I’m thinking you are right. I definitely need to get one of those in for review. Good call. Subscribe to our geek goodness and get only occasional updates to your inbox.